Why The Domain "Poo.Com" ? Fine, let's deal with this one first as it is one of the most commonly asked questions within the chat. The real answer is that is wasn't just Poo.Com and still isn't the only domain to point to the chat application. That said, it is one of the original domains and the most well known of those that still do. 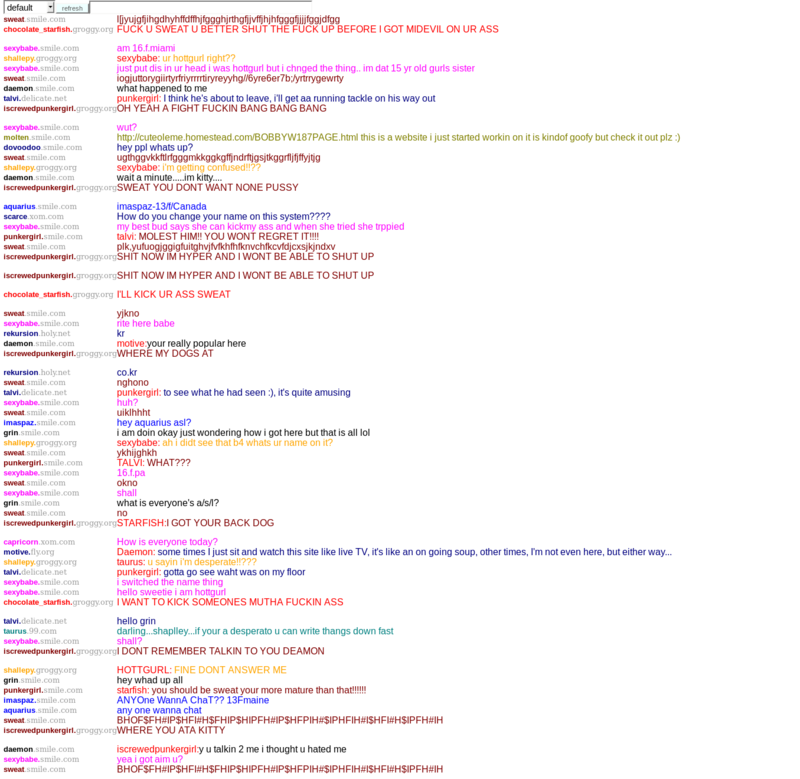 With the full list being more than 250 domains as mentioned here: Poo.com Chat Domains (originally posted in 2003). However it should be noted (a mere 15 years later) that several wrong assumptions were made in the first section of that page. For example the domains were always intended as long term investments, with few even being sold on either side of the Dot Com Bubble and for those that were, it was usually a reluctant sale. However, back in the late 90's domain parking was still in its infancy and needed time to mature. In the meantime there were many domains waiting to be pointed to "something" and that something over time became a chat application that was like no other. If there is one constant you can rely on, that constant is change. To see how our chat application has changed over the years here are just a few historical screen-shots. Because there was a period of time when our chat application only supported the IE web browser. Archive.org's crawlers would have been detected as non-IE and therefore redirected to a parked page during this phase of the chat's history. In summary, we should consider that this kind of experiment will very likely never happen on the internet again. Especially with such prime, high calibre domains as the ones that have been used through our chat's history. As was mentioned on the Welcome page, no one can deny the uniqueness of Poo.Com's history and given that no one is likely to try this again, on such a scale. Let us share some of the Pros and Cons. It is worth remembering that this was at a time when search engines were still young (MSN and Yahoo just five years old and Google only two years old) and much less used. So type-in traffic was much greater than it is today. There were always many different people with different interests, as they would be typing in random words for domain names and landing on our chat. As one of the domains for the chat was man.com, we would often get a decent amount of people that would mistype "msn.com". As well as a good amount of Chinese users misreading "qq.com" as 99.com. As Bob Ross would say, "happy little accidents". It is obviously expensive to have so many domains pointing to one site. Especially a chat site that does not run any advertisements. Some of these domains are clearly VERY desirable to other people on the internet and it is just a matter of time before some large company comes along with an offer that can't be refused. As was the case with 99.Com not so long ago. We have therefore sadly lost more chatters from our network than most sites could ever hope to gain.